It’s always fun to spend someone else’s money, and that’s exactly what I did when I received some cash from the family for my 43rd birthday. I COULD have spent the money on something practical like clothes, but where’s the fun in that? Christmas and my birthday are when I like to splurge and buy that extra special bottle of whisky. While browsing the whisky aisle at Total Wine, I stumbled upon a bottle of Talisker that I hadn’t seen before (I am a huge fan of the 10 and 18 year old Taliskers!). The Talisker Distiller’s Edition, which I eventually purchased after some mild contemplation, was distilled in 1998 and bottled in 2009, and has an ABV of 45.8%. This particular Talisker expression is double cask matured, i.e. it starts off in American oak casks and is then transferred to Sherry casks for a second maturation. Unlike the 10 year old expression which has a golden yellow color, the Distiller’s Edition has a darker, toffee hue. The final Sherry finish gives this whisky a sweet aroma with much less smoke than the 10 year old expression. This sweetness carries through to the palate, which results in a much more approachable (there goes that word again!) Talisker. People either love or hate the Talisker 10. The Distiller’s Edition is much less polarizing. Less spice, smoke, and saltiness. More sherry, dried fruit, and vanilla. I give this whisky a B+. The sole reason for not giving this whisky an A is the price. The Talisker 10 is available for around $50, while the Distiller’s Edition sells for over $80. 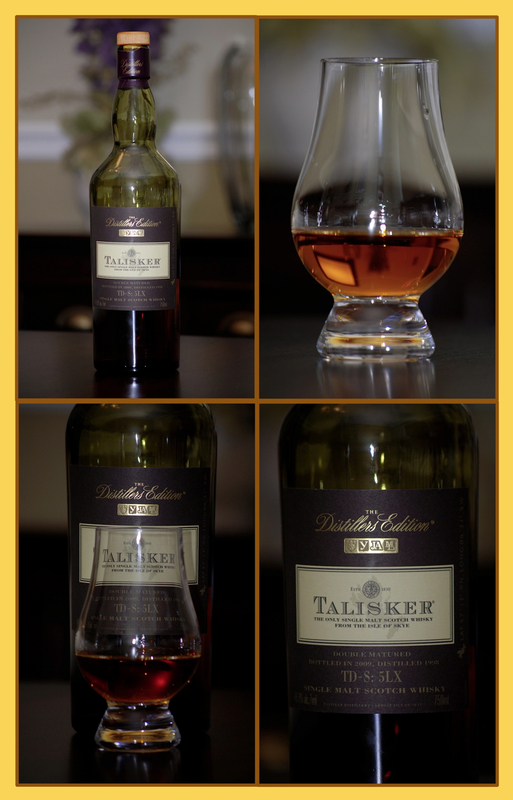 The Talisker 10 is one of my favorite whiskies and is a relative bargain. Try them both and let me know what you think. I love Talisker! Based on your review, I think I’ll stick with the 10 and not mess with a good thing. Not that I don’t like port or sherry cask finished scotches, I just don’t want to mess with my Talisker! Great review – thanks!